So. Last summer I used this heifer for 4H. I placed last in my class... Not good... Anyways. We want to breed this heifer to a bull to fix some of her downs... Now here's the problem... Idk what needs the most improvement. I just thought I would get your opinions on what u think needs the most improving. I will get the name of the bull that she is going to be bred too. Or at least his dads name. He is out of an AI Simmental and Reg. Red Angus bull. She is a little dirty in the 2nd pic but it just got done sleeting and everything was a mess. I'm curious what the judge's comments were about her and her classmates. What breed is she, or did she show as? I like her overall look. She has good lines and angles. I'm not crazy about the way her neck ties into her shoulders, but that pic isn't a good one to judge from. I also think she's a bit light on her rear third. She had a great middle with plenty of rib and depth, but she doesn't carry that in her hip like I would like, just lacks muscle shape in that area. The pictures aren't great (can't see feet well for example) and photos only show part of the picture. I think she would be a great breeding piece, with plenty of options for breeding. What would you change about her??? I heard the judge talking to himself and he said she was a little light in the hind quarters. Her dam is a Tarentaise and sire a Gelbvieh. I can get pica of her mom. But don't have the dad. Her mom keeps the dairy build so she never gets fat like the beef cows. She has a little sway back from carrying a heavy calf and being 8½ months pregnant in this pic. I would change her rear. Maybe have it a little more filled out and widen it a little. I am still learning but am going to a class on judging cattle this summer. The classes are a good idea. The more cattle you evaluate, the more comfortable you will become with it. As for first calf breeding, I would go with Angus with some calving ease. A live calf is what you are after, and the first time around is the most important. This will also help you get a base so to speak, for what type she produces. She has a typical Angus hip, so for second calf mating, you could look to improve that. My suggestion would be a continental breed bull, whether it be Limi, Simmi, ect. I would still be sure to get something calving ease at this point, since the overall structure of her hip makes me a bit leery on her calving ease, if that makes sense. She is plenty wide through the top of her hips, but gets pretty narrow from there back. The bull she is going to be bred to is a SimAngus. He has a 75-80 pound nothing weight. She will be 3 years old when she first calves. And she is over 5ft tall at 2 so I think she's gonna be a big cow. Just keep in mind that there is more to calving ease than a low birth weight. I expect our cows (not heifers, cows) to drop a 100 pound calf with no help, but the bulls they are bred to are the right type to produce smooth jointed, long bodied calves. A 65 pound brick is still gonna come out harder than a 100 pound smooth made calf. Also, you cow may be big and still have a small pelvis, or pelvic opening. Thanks for the warning! The calves thisguy has don't get big butts or shoulders till they r a few weeks old so I think she'll be fine. I'll post pics of bull when he comes. Looking forward to a pic of the bull. That heifer could be a good breeding piece. I think the right mating could make a really good calf. 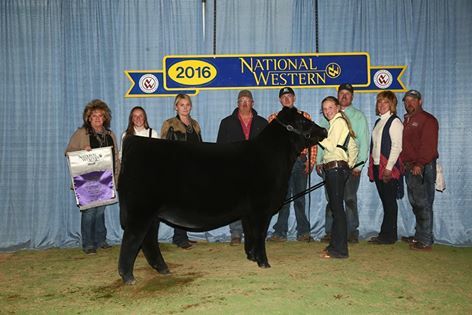 Are you hoping to produce more cattle that you can show out of her? Or are you looking just to get a more beefy calf? Looking for better show calves. Yeah. We will see what happens. Hopefully she gets bred this year. Three cows never got bred last summer. There's a chance we will just use this bull a time or two. Depends on how the calves look. I just remembered I have an old pic of the bull. She is not a bad heifer, just a little plainer made than a show heifer, she slopes a little to much from hooks to pins and is narrower in the rear and if you're going up against a show type heifer you going to get sorted quickly. producing beef but it gets knocked down in the show ring. Breed her for a live calf this time and then next time start looking for a bull that will add some rear and a little look to her, Try an Ali(Clone), Dirty Hairy, I-80 (both Ali sons) the next go round and see how they work on her, they start small and really turn it on as they grow, but will add a little show to them, and you can keep the heifers since all three bulls are TH and PHA clean. What do u mean by add some leather? The bull you pictured has an excess amount of skin from the brisket to his throat. A Simmental trait. Most of your show calves are clean necked, sometimes to the extreme. Are looking to breed show steers or heifers? If it is heifers you need to try and breed something you can paper, steers, it does not matter. 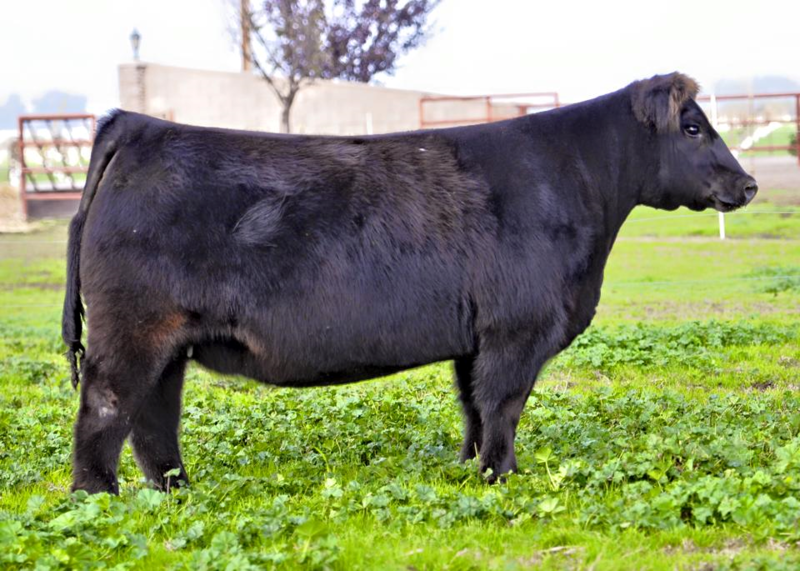 This is an Angus heifer that has been winning all over the country this year, she has a full sister doing the same; they just have that little extra look to them, the hard part is trying to get the look and keep them real world at the same time. Last edited by VCC on Fri Apr 22, 2016 12:23 pm, edited 1 time in total.